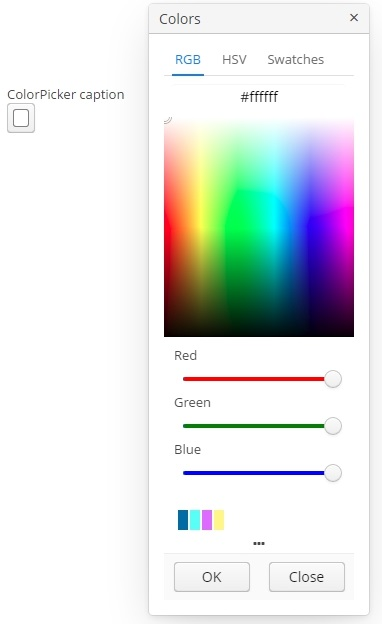 ColorPicker is a field that allows a user to preview and select a color. Component returns a hexadecimal (HEX) value of the color as a string. The figure below shows an example of the color picker with the popup closed. To create a color picker connected to data, use dataContainer and property attributes. buttonCaption - caption of the component button. defaultCaptionEnabled - if set to true and buttonCaption is not set, displays HEX value as a button caption. historyVisible - determines the visibility of history of recently picked colors in the popup window. rgbVisible - determines the visibility of the RGB tab. hsvVisible - determines the visibility of the HSV tab. swatchesVisible - determines the visibility of the swatches tab. By default, only the RGB tab is visible. popupCaption - caption of the popup window. confirmButtonCaption - caption of the confirm button. cancelButtonCaption - caption of the cancel button. swatchesTabCaption - swatches tab caption. lookupAllCaption - caption of lookup item for all colors. lookupRedCaption - caption of lookup item for red color. lookupGreenCaption - caption of lookup item for green color. lookupBlueCaption - caption of lookup item for blue color. getValue() method of the component returns a string, containing a HEX code of the selected color.